This is a shot taken from a riverbank, looking up toward a nice old bridge and into the sky beyond. 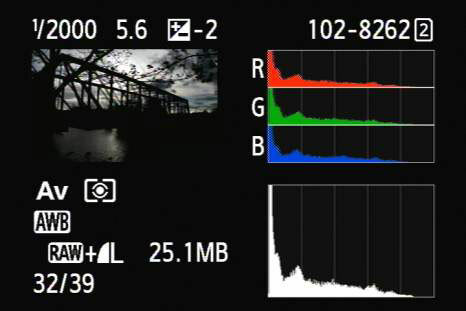 As you can tell from the heavy concentration to the far left side of both histograms, this photo is underexposed (although it still has a nice quality to it). Although this is dark, it’s not underexposed. The histograms don’t go off the left edge. This means that shadowy detail is present, but dark. This still life is presented very brightly. The histograms don’t go off the far right edge. This means that you haven’t lost any data, even though everything looks white. This photo is shot into the sun. Two people are sitting on benches inside a gazebo. 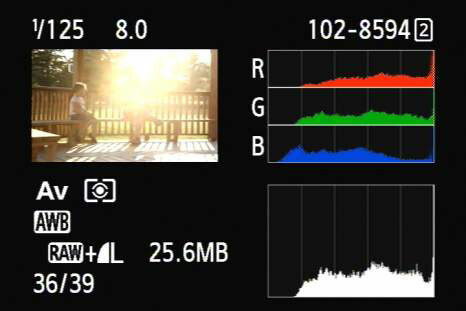 The sun overpowers the bright side of the histogram, resulting in clipped highlights. This is a photo of a rough concrete path. It’s almost perfectly gray. 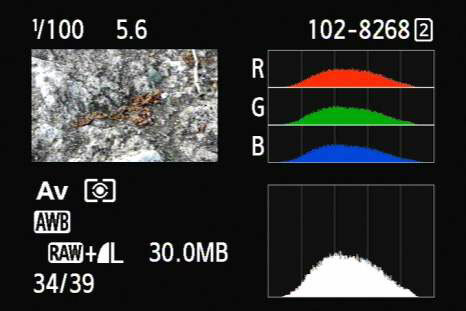 The large hump in the middle of both histograms, combined with little extremely bright or dark areas, indicates low contrast. This scene has a nice mixture of reds, greens, and blues, as well as brightness values. 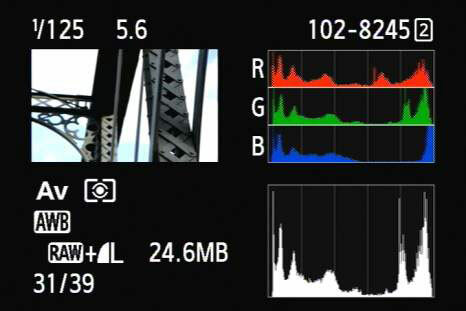 The histograms are wide and the photo shows good, but not overpowering, contrast. This photo introduces more contrast. 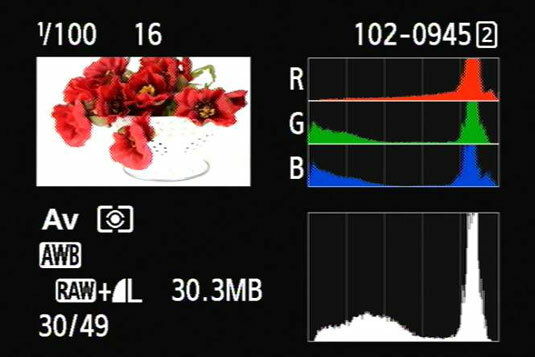 Notice the lack of mid-tones in the center of the histograms. Most of the data in this picture is on one end or the other, without being clipped. That there’s no lost data is key to preserving detail, and typical of a well-executed high-contrast photo. This shot was taken from the inside of a garage. 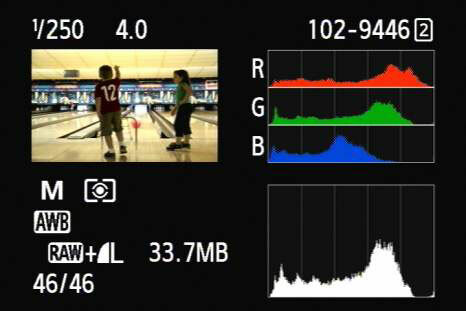 The camera was set to Manual shooting mode and the aperture and shutter speed were set to maximize contrast. 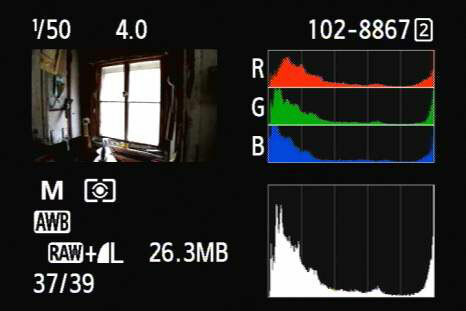 Despite the impressive dynamic range of the camera, (the Canon EOS 5D Mark III), the photo blows out details in the window and pushes the dark areas off the left side of the histogram. This photo shows a nice range of color and brightness. 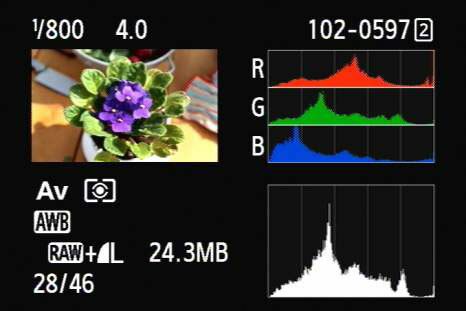 The main reason it is included is so you can compare it with the next photo to prove that histograms can display similar properties while the photos are very different. Although the pins in the distance look white, the overall color balance in this shot is skewed toward an ugly yellow. 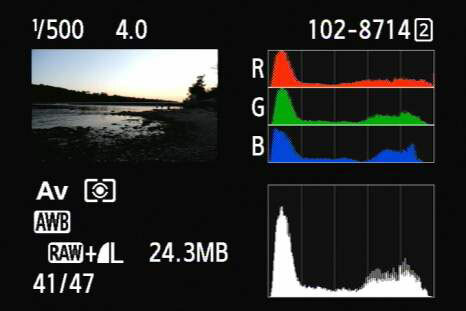 One look at the RGB histogram confirms that the photo has too few blues. 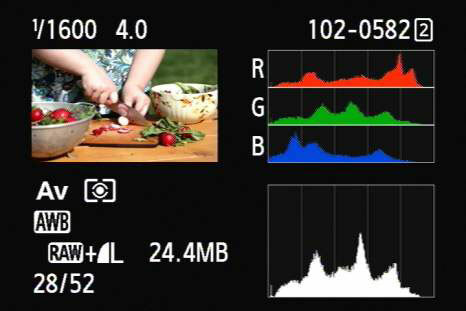 Although the previous photo blues are primarily dark, they extend throughout the brightness range. In this photo, they drop out early.